Presenting current service tax rate chart for year 2014-15. You can find service tax rate chart 2015-16 with amended rate 14% here.- LINK. The new rate is applicable from june 1, 2015. Service tax is indirect tax levied on service provided. Service tax is charged at various rates due to availability of exemptions and abatements on various services. Use this chart to decide service tax rate applicable to you. When will new service tax rate 14% be applicable? Current service tax rate is 12%. On it, 2% education cess and 1% higher education cess are added. So the effective service tax rate is 12.36% (12% + 3%). This is standard rate and it can be reduced as per available abatement and exemption. Accommodation booking 10,000 90% 1000 124 1.236% No cenvat credit for input, input services or capital goods.Invoice includes amount of accommodation. A package tour 10,000 75% 2500 304 3.09% No cenvat credit for input, input services or capital goods. Other tours 10,000 60% 4000 494 4.944% As aboveThe bill includes gross amount charged for tour. Please note that effective rate is for easy calculation. You can use effective rate direct on amount (column 1). So service tax payable is column 1 * column 4. Taking one example, suppose Mr. Ram provided taxable services worth Rs. 200000 to Mr. Rahim. Service tax rate is 12.36% but abatement available is 70%. from 1/4/2015 with regards to budget 2015 changes. In taxation field, the important thing is to consider notifications and updates while following any rule. I always try to consider changes in tax rules before writing article.still When you apply this rate, please consider necessary amendments and notifications also. There is no exemption available for environmental products. It is latest rate chart. I am working with Security Services as an Accountant. Do we cover under reverse charge Mechanism( 25% : 75%)? Do we have to raise bill with full 12.36% or just 3.09% is fine? If you work in company and it provides supply of manpower service, no reverse charge mechanism will be applicable. If you work in Individual firm, HUF, proprietary, partnership firm, AOP and it provides supply of manpower service, reverse charge mechanism will be applicable if you provide service to body corporate – company and rate will be 3.09%. It is Security Pvt Ltd Company( Registered pvt ltd Company). It is providing Security services (Security Guards) to Banks,some of the banks deducting 75%(9.27%) of the Service Tax, paying rest of the amount and stated as we comes under reverse charge mechanism. Some other banks are paying 100%(12.36%) of service tax with bill amount. Please let me know on this issue. Charge 100% service tax on bill because reverse charge is not applicable to company to company transaction. So banks have to pay bill + 12.36% service tax. We are providing security services to clients,Do we cover under reverse charge Mechanism( 25% : 75%)? Do we have to raise bill with full 12.36% or just 3.09% is fine? Please any body can reply on this . iam working in a builder/ Developer firm, we are doing villas and apartment projects, what is the service tax rate which we have to pay? and could you please give a complete chart of service tax (works contract) rate from 1/4/12 to 31/03/14 ( any change have in rate of service tax in this period for works contract) ? For work contract of construction work , rate is 4.944% if there is no reverse charge applicable. When there is reverse charge mechanism is applicable, rate is 2.472% each for service provider and service receiver. Read this post on reverse charge mechanism for more inside. Renting of motor vehicle under RCM has been changed to 50 % and 50 % for the service provider and service receiver with effect from 1st October 2014 . Kindly update in the above chart, it is misleading. I am working in a Air conditioner Sales and Service Showroom . Please tell me the Correct Service Tax and Abatement %…. Check rate of service tax on work contract. The applicable category for repair of air conditioner is maintenance, repair , restoration of goods.Rate when there is no reverse charge mechanism 8.652%. When there is RCM, rate is 4.326% for service provider. I have a confusion that bothers me alot. If a hotel, who is providing restaurant service, rooms service and banquet service and is providing all these services at abated rates, it is definitely allowed to claim cenvat of input services as provided for in 24/2012 and 26/2012. However, could the hotel claim the cenvat at full rates? I mean, the hotel building is on rent and the owner pays say 25000 as service tax on rent of hotel building at 12.36% and provides the above mentioned services at abated rates then can he claim the cenvat at full rate being 12.36% or he has to bring it down to abated rates which is something impossible practically since, all three services are being provided from one premises and bifurcation of cenvat at abated rates is difficult. Thanks in advance. I am eagerly waiting for a reply. Credit Rules will be applicable. So use rule 6 and pay service tax on 6% of value of goods sold as per rule 6 (3) of cenvat credit rules. (as you have not maintained separate books for exempt and taxable services . For bundled service, full cenvat credit is not allowed but you have to reverse credit as I have mentioned in reply before. Please help me with the current Service Tax rate for Annual Maintenance Contract and repairing & maintenance for Analytical Instruments. Is there any revision as it was 12.36% earlier? If yes then what is the new rate and it is with effect from when? Awaiting early response please. Annual maintenance contract is covered under work contract if you supplies some material too. The rate is 8.652% with abatement. If reverse charge is applicable , rate for service provider is 4.326% of value. read our post on reverse charge mechanism. http://taxmasala.in/reverse-charge-mechanism-in-service-tax/ If you only repair the instruments and no material is supplied, the service is repairing services and rate is 12.36%. It is taxable under technical inspection and certification services. Rate is 12.36%. We did Refrigeration AMC and refrigeration placement(Freight) also, What is the tax shall be provided to customer and what is the reverse tax?Customer said that freight& halting tax they not given. If you are providing maintenance service with supply of refrigeration, it is work contract and you are required to charge 8.652% following composition scheme. Reverse charge will be applicable when you provide service to companies. In that case, you are required to charge 4.326% on bill. we have pay the rent a cab service, but i got confusion for 40% gross value will be pay the service tax 50% pay service tax provider or 50% Receiver. what pay the service tax amount? If service provider is not availing abatement, rate is 12.26% when there is no reverse charge mechanism. If he is availing abatement, rate is 4.944% and there is no RCM. If he is not availing abatement and there is RCM , rate is 6.18%. (he has to charge 6.18% on bill) and . I will publish one article on rent a cab soon.stay connected with taxmasala. Does Renting of Air Conditioner come under Service Tax ? We give Air Conditioners on rent , do we need to charge service tax from the customer? yes, it is taxable under section 66E (point 6). If turnover of your services exceeds Rs. 10 lakh per annum. how much service tax would be charge for Student Tanning, Seminars of pvt. ltd. company. If there is private coaching, service tax is required to levy at 12.36%. But if coaching is to pre school and higher secondary students , those service is negative list (l) and no service tax is required to charge. Seminars to pvt ltd company is taxable fully. For tour operator service, if you are not availing cenvat credit, you can avail abatement. If there is only accomodation booking, the abatement rate is 90%. Suppose total value of accomodation booking is 10000. You can avail abatement of Rs. 9000. And required to pay service tax on 1000 at 12.36%. So service tax payable is Rs. 123.6. Which you are required to charge in bill. If you are availing cenvat credit, you are required to charge service tax at full rate on full bill value. 12.36% on 10,000. 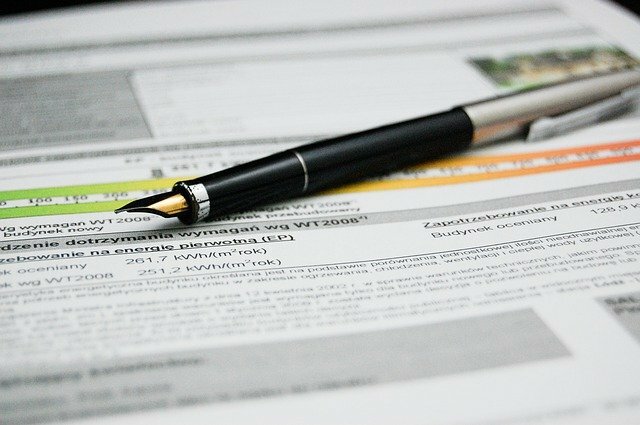 No, you cannot claim cenvat credit while availing abatement benefit. I have a proprietory concern unit. I provide the man-power supply to a Pvt Ltd Company. I want to know that , how much service tax should I have to charge in my bill,wrt the latest Budget. Manpower supply service is now fully in reverse charge mechanism if provided by individual to company. You are not required to charge service tax in bill when charged to pvt ltd company. Company is required to pay itself through reverse charge mechanism. This change will be effective from 1/4/15. Hi mam,please tell me if i am providing manpower work to individual can I add service tax in bill. If your turnover of total services provided during the previous year exceeded Rs. 10 Lakhs, charge 12.36%. (14% from june 1, 2015). If your turnover of service provided during the year is less than Rs. 10 lakh, there is no need to charge service tax. Other wise your service tax rate will be 12.36% on bill. (agency services provided.) If you sale raw material, it is sale and out of scope of service tax and only vat is to be charged. It is tour operator service. Go through the chart and see column of tour operator services. I am photographer. I add 12.36% service tax to my final invoice. If I delay depositing service tax amount 20 days beyond the last date what is the penalty? and how its calculated. Interest is payable at 12% p.a.on tax amount. penalty is Rs. 100 per day during which the failure continues. ST was exempted for maintenace of govt. Building with govt bodys and PSU. Is the exemption taken back now or is it for contruction work only? Maintenance is similar to manpower supply. c) pipeline, conduit or plant for (i) water supply (ii) water treatment, or sewerage treatment or disposal. We provide non medical and medical services at home to families in care need which includes nursing attendant, nursing procedures, physiotherapy sessions etc. Do we have to pay service tax and if yes then how much by client family and how much by company? Medical services are exempt from service tax. So no need to charge service tax. Notification no. 25/2012. Section 66B inclusion in mega exemption. For my under construction flat in an apartment, the builder has divided 30 lakhs as the Basic Price and defined 5 lakhs towards “Other Charges” in the Agreement. He has charged 3.09% on the Basic Price but is now chanrging 12.36% service tax on remaining 5 lakhs. Is this correct for him to charge 12.36%? If it is correct could you please refer me the circualr / notification number given by Govt. Of India? Other Charges include Corner + Park Facing Charges, Dual Meter Charges, Lease Rent etc. He is correct because the other charges are not construction activity but other services. The same rate will not apply because the services are not naturally bundled services. I would like to as per 2015 Budget Service Tax will be charges as 14.02% w.e.f April 1st ‘2015.Please let me know i read the budget copy but i have little bit confusion in that.please brief me about this? I would like know to as per 2015 Budget Service Tax will be charges as 14.02% w.e.f April 1st ‘2015.Please let me know i read the budget copy but i have little bit confusion in that.please brief me about this? Service tax rate 14% will be applicable from the date notified by central government. It is not applicable from 1/4/15. I would like to know how to make board resolution for applying solvency certificate in the bank? please let me know urgent? Please get help of some CS as we are not discussing companies act yet. Kindly provide information on the following. I have a few buildings which I have let out to tenants on monthly rent. One such property has 8 shops at the bottom of the building but the rest is let out to other tenants who use it as their residential flats. My total rental income for14-15 has just crossed about 10 lakhs which includes rental earnings from both commercial shops & residential flats. Is the earning from residential flats service tax free or is it all going to be clubbed together for the purpose of service tax calculation? Is there any abatement on rental income? As this is the first year that my rental income has crossed Rs.10 lakhs what is the service tax to be paid by me and when is the deadline for payment? Kindly advise. There is no exemption for rent for residential use. You are required to get registered yourself with service tax department and start charging service tax on bill. Suppose this year’s total rent is 12 lakh, you are required to charge and pay service tax on 2 lakhs only. Ma’am, in continuation to my earlier query regarding payment of service tax on rental income from immovable property, kindly inform me whether service tax on rental income is payable on accrual basis or actual receipt basis? Is it compulsory to issue invoice/bill to tenants demanding rent every month? Since this is the first year that my rental income has exceeded 10 lakhs, when is the last date for payment of service tax on income exceeding 10 lakhs? I have checked the list of exemption and renting of residential dwelling for use as residence is exempt. So you are not required to charge service tax on that. Other income should be covered under service tax area. You can pay service tax on receipt basis as your turnover of previous year is less than Rs. 50 lakh. You are required to issue invoice to tenants per month. It is compulsory. Read my post http://taxmasala.in/service-tax-invoice/ to know more. Still you have any query , you can ask. Last date for payment of service tax for this quarter is 31st March. First, you need to register your self under service tax act. I had booked a flat in dec 14 for Rs 60 lacs and paid Rs 10 lacs till now. The registration is expected next week. Builder received OCcupation certificate yesterday. Pls advise if I need to pay service tax on balance Rs 50 lacs as I am paying it after OC is received. If you are purchasing flat, service tax will not become applicable. If you are receiving flat through construction by builder and amount is paid before completion certificate received , service tax should be charged. Yes, it is correct. Because 60% abatement is available for food service in restaurant and 12.36*40% = 4.944% on gross bill should be charged. New rate of 14% will be appplicable from the date of enactment of finance bill 2015. The date will be notified by central government. The abatement rate has been changed to 70% for all transportation – by road, air or vessel. New abatement rate will be applicable from 1/4/15. So new rate will be 12.36*30% = 3.708%. Once the new rate becomes applicable, the rate will be 14*30% = 4.2%. Charge 12.36* 25% ( old rate) = 3.09% till march 2015. I am running Service apartment which means just Fully furnished apartment without any service or food . These apartments are rented to company only for residential purpose. Company staff are staying no business in the apartment. Does this qualify for Service tax ? If it qualifies for Service tax , Is there any Exception ? Around 11 lakhs is the income but does not include the expense. If Service tax applicable , do we pay for the income or for the profit ? This is a very useful page I stumbled upon. We are a professional training provider and registered as Commercial Coaching or Training in Service Tax Form ST2. We have not collected and have not paid service tax for FY13/14 & FY14/15. My accountant says I must pay service tax on entire sales @ 12.36 which is running too much. Can I avail 70% Abatement as per your chart above? Under All other cases option? Please update me. There is no abatement available for commercial coaching. You are required to pay service tax at 12.36%. Once your value of services exceed Rs. 10 lakhs annually, you are required to calculate, charge and pay service tax. Hi, I am serviced apartments operator, currently we charge 7.42 as service tax after 40% abatement . New charges 14% applicable from April 1st or do we need wait for any notification.? If yes what should be charges .? Do we need to pay service tax on the monthly L&L compensation ? If such tax be applicable, Is there a mechanism to avail apportionment of tax applicable between Service provider and receiver ? If such tax is applicable, is there an abatement applicable ? IF your service provider’s annual service tax turnover does not exceed Rs. 10 lakh, no need to pay service tax. Ask him first. If the turnover is more than Rs. 10 lakh, it is his duty to charge and collect service tax and pay to government. Rent of premises is taxable service under the head renting of immovable property. There is no reverse charge mechanism applicable to this service tax. So service provider is required to charge tax. Many Thanks for your speedy response and advise ! Would any tax sharing between service provider and receiver or tax abatement rates be applicable in case of our Veterinary Clinic ? Have you asked your landlord about his turnover of services? If it is not crossed Rs. 10 lakhs annually, no need to worry. Service tax will not be applicable. There is no sharing for service of renting of immovable property. If you are providing medical services, service tax will not be applicable in this case. The service should be provided by qualified doctors. is there any notification for same? In budget 2015, there is change in abatement for transportation service. Abatement rate for transport of goods by rail is 70% and you are required to charge service tax on 30% of total bill. The change will be effective from 1/4/15. 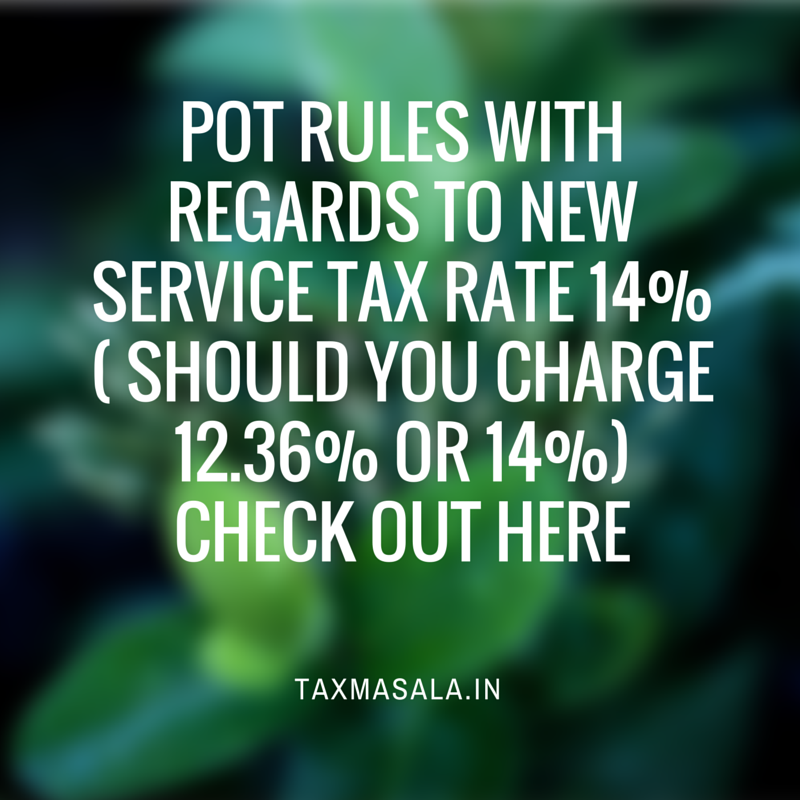 Until new service tax rate 14% shall be notified by government, consider service tax rate as 12.36%. Read my post, for further clarification. plz reply the rate of service tax on sales of hotel services (ibt)? Hotel only or hotel with restaurant? Read our article on service tax invoice. You are required to charge 12.36% on bill until new rate 14% be notified by government. We run a hotel and we claim abatement on both restaurant and room bills. Separate books for restaurant and rooms are maintained. I can claim CENVAT for restaurant turnover – which items are covered. Secondly for what capital and other items I can claim CENVAT credit for amount collected as service tax for room rent. You cannot claim cenvat credit as you are availing abatement scheme. I will publish separate article on cenvat credit soon. Stay connected with taxmasala. Whether it is mandatory to take abetment of Transportation of goods by Rail ? As per the notification no. 8/2015, cenvat credit is not admissible on the services of Transportation of goods by rail. Can we claim the cenvat credit if we provide the same service without abetment of 70%. If you do not avail abatement, you can charge service tax at 12.36% and take benefit of cenvat credit. You can choose beneficial option. We are Quintessence Technologies Ltd.We do web sites, web applications and web branding/SEO. We also have a wing that mentors graduates to find their career/personal training. I would like to know if this mentoring fee comes under service tax and if so do we have abatement. If it comes under service tax 100%, is it advisable that I do the mentoring on a personal basis or as a partnership company to avail abatement? Mentoring service is not in negative list of service tax. The service is taxable and you are required to charge 12.36% on bill. There is also no reverse charge mechanism available for this service. So form of business is not important here. I am running Service apartment with Service tax rate of 7.41% after abatement as per your guidelines. Here we are providing accommodation only for corporate employees to stay and rent is collected on monthly. Service tax for the rent is also shown in the invoice. But Current / Electricity charges are actuals which corporate need to pay as part of the monthly rent. If current charges are added in the invoice then we need to collect service tax . Is that correct ? But practically current/power we should not collect service tax. Can I show the power charges in the invoice and don’t collect service tax for it ? Is that correct process ? It is paid by you as pure agent and not covered under service tax liability. Don’t need to charge service tax on it or include it in service tax value. Cleaning services is covered under service tax and is taxable. If you supply manpower for housekeeping, it is also covered under reverse charge mechanism.If proprietary concern provides service to company, 100% service tax shall be paid by company under reverse charge. Budget 2015- update. I posted the following on 13th April and still await moderation.Could you please expedite? We are agents for Sales/Service/Installation/Maintenance of Scientific/Analytical Equipments from various overseas prinicipals. Customers buy the goods based on our sales promotion directly from our principals after paying our Principals by LC/TT remmitance. We get a overriding commission for Sales/Installation/Commissioning/Maintenance for Warranty period ranging from 1 to 5 years. Can we use abatement clause(as we don’t get CENVAT credit) and consider this under “Other works contract” to pay service tax of 7.41% on 40% of our Commission? Would appreciate your help in clarifying our doubts. In our case we can neither charge the customer nor our Principals. Therefore we would like to have this doubt clarified at the earliest please. I am very sorry for late reply. In your case, you are not providing work contract services but you are working as commission agent. So abatement is not avaialbe and 12.36% service tax rate will be applicable. Other points are please refer place of provision of services rule. As per rule, location of service provider – (your company) should be India for taxability. i am operating photo colour lab, i pay service tax on full amount or any calculations. please suggest me. Please give more details of your question. Mam, What will be the rate of Service Tax to be charged on Commercial Vehicle given on Rent? All the expenses like Fuel,Driver,Maintenance will be by Service provider. The rate will be 12.36%. If it is commercial vehicle and renting for transportation of passenger, 60% abatement is available and rate is 4.944%. I started a proprietorship firm (marble business), my turnover crossed Rs. two crore and paid transport charges more than rs. 25 lakhs. Is this cover under reverse charges ?? i m only trader not manufacturing concern. If you are only selling marbles, no need to charge or pay service tax. If you are providing any service, the service tax will be applicable. For proprietor y concern, you are not liable to pay service tax under RCM. Hi.Kindly advice on the WCT tax that needs to be considered for a electrical contract for a new building? For work contractor of original work service tax would be levied of 40% of bill at 12.36% ( Up to 31st May , 2015 ) and 14% from june 1, 2015. SO the rate is 4.944% Upto 31st May, 2015. New rate will be 5.6%. If you only sell the ready made flats , no service tax would be charged. If you promote flats of others and get commission, it is commission income and you are working as agent. Service tax would be levied at 14% with effect from 1/6/15. However, read my post about small service provider exemption. Please give more details about question. 1) What is the rate of Service tax payable on “Renting of immovable property Service” and is there any abatement? 2) Since the Service tax Registration number was only generated on 19.5.15 through Form ST-2, do I now have to pay the service tax on the amount of rent that has exceeded Rs.10 lakhs? The total Rent collected during 2014-15 amounted to Rs.1105785 and accrued rent ( Due) for 2014-15 amounts to Rs.75982/-. On what amount do I pay Service tax. 3) When should I file the Returns and for what period as the due date of filing the Return for the period (Oct’14 to Mar’15) has already expired. 4) Will I have to pay any penalty or interest on any of the above. I shall remain ever grateful for your kind advise on the above. New rate for hotel service with supply of food is 9.8% on bill and for restaurant service, rate is 5.6%. Can a transporter (service provider) collect ST from any Pvt Ltd or Ltd Company? Please clear out his in brief. 9.8% when there is no reverse charge. and 4.9% when there is reverse charge. I HAVE A HOTEL AND REGISTERED IN SERVICE TAX AS HOTEL, ACCOMMODATION. AND CHARGE THE SERVICE TAX ON ROOM, ACCOMMODATION. IN HOTEL I AM PROVIDING THE FOOD TO CUSTOMERS BY ROOM SERVICE. I ALSO CHARGE THE SALE TAX ON FOOD. IN BILL FOOD AMOUNT IS CLEARLY SHOWN SEPARATELY. I HAVE NO RESTAURANT IN HOTEL. I PROVIDE THE FOOD ONLY IN ROOM. WHETHER SERVICE TAX WILL BE APPLICABLE ON SUPPLY OF FOOD. SOME ONE HAS TOLD ME THAT YOU ARE PROVIDING THE SERVICE TO CUSTOMER. SO IT COMES UNDER THE OTHER SERVICES. WHETHER I AM LIABLE FOR SERVICE TAX ON SUPPLY OF FOOD ?. IF I HAVE TO CHARGE SERVICE TAX THEN WHAT RATE OF SERVICE TAX WILL BE APPLICABLE ? KINDLY SUGGEST ME QUICKLY. You are not providing restaurant service but providing food with hotel accommodation. It is clearly bundled service. Service tax rate will be 9.8% ( Single rate) on total bill ( Hotel charges + charges for food supplied in accommodation) without vat.Remember cenvat credit of goods is not allowed while availing abatement. – If the service is provided by a Pvt Ltd company to an Pvt ltd company. The rate of service tax for cleaning service is 14% from 1st june, 2015. There is no reverse charge applicable for cleaning service so no matter who is providing service to whom. it is not work contract service and no abatement or exemption is available. However, check SSI exemption details from following link. How many time service tax return fii up in the year and month? Service tax return is required to file half yearly. Madam i along with my few friends established a small firm and working in Data digitization or Data entry projects since January 2015. That Madam our first project will completed soon which Value is Rs. 4 lakhs 96 thousand. So madam firstly, we want to know weather we need service tax registration and if so then what is the process for the open of an service tax registration. Secondly want to know what is the percentage of service tax of such kind of firm. You can avail small service provider exemption up to first 10 lakhs turnover ( April to March )and no need to charge or pay service tax. Read my post for further clarification. I am retired working as Consultant providing ESH advisory service and providing support in the area of training, risk assessment,safety review etc. I am charging as professional fees and donot exceed Rs 10 lakhs/annum. Do I still have register for Service tax and pay ? I am a reseller of software products. My purchase invoice has service tax and vat. If I further sell this product to end user, Do I have to charge service tax?. If yes, then can I get abatement on my purchase – service tax? What percentage of abatement? No, you are not providing any service. You are selling in built software so service tax is not applicable but vat is applicable here as per state vat laws. Yes, you can get exemption up to first Rs. 10 lakhs bill. Charge service tax after Rs. 10 lakhs limit. Read my post, for better understanding. i) In which consts. (projects) service tax is applicable. ii) who will pay the service tax amount. iii) May the department can deduct the service tax from our bills. iv) May the departments can mention in their tender notice that the service tax (as applicable) or coming into force shall be deducted from the bills of agency. Please help for our query and oblige.I will be very thankful for obligation. You can avail composition scheme and pay service tax at abated rate ( Depends on work) on total bill excluding material supplied by contractee and deducted from bill or you can separate service and material portion and charge 14% service tax on bill. Reverse charge mechanism will also be applicable in case of work contract. You need to take care of all the points. Add 14% on 28000. and deduct 1% from 28000. Not from service tax portion. One of our client is providing renting of immovable property services for his building. He can get abatement benefit if he is not availing input tax credit. we are doing refrigeration and air conditioning services for factories and star hotels. Can you tell us the percentage of service tax for us to claim from the customer? If you are not supplying material with service, apply basic rate – 14.5%. Otherwise go with service tax rate for work contract. Reference for imp posts for better understanding. Thanks for the detail. We are billing to the customer inclusive of consumables ,such as gas, pipes and welding materials. So what is our tax rate? Hi, I am a tour operator, my gross receipts in last three year is Around Rs. 25-30 lakh per annum. For such service, service tax is payable on 25% after deducting abatement. My query is while calculating threshold limit of Rs10 Lakh for small service provide we need to consider whole amount(ie Rs. 25-30L) or only 25% of the same. Do i require to pay service tax for last years please advice. i have DJ business. I provide DJ in marriages and functions. I registered under service tax act on 04/04/2014. I did not file service tax return so far and did not deposit service tax charged by me. How much i will have to pay as penalty for not filling service tax return and rate of interest for not depositing service tax. But services of renting by hotels, guest house meant for commercial purpose are taxable. Now, in your case, what you have given on rent is not residential dwelling but similar to guest house ( which can be used to give on rent basis – commercial purpose in short), service tax liability will become applicable. I have checked twice for clarification. Better is that get registration certificate and start charging and paying service tax. Thank you Madam for your quick response. Please let me know the service tax rate as on 2014-2015 as I see 40% abatement . Is that correct ? Do I need to pay service tax 12.36% of the total income or is there abatement applicable ? If you are not availing cenvat credit on input services, inputs and capital goods, you can avail abatement 40%.